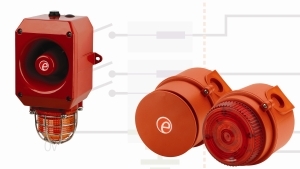 E2S has published a complete guide for easy specification and installation for its range of intrinsically safe sounders, beacons and combination devices. The guide is based on the ATEX certification, but in general, the guidelines apply to other intrinsic safety standards, including NEC and IECEx. Focusing on interface selection, the guide offers advice regarding the advantages and disadvantages of Zener barriers and isolation interfaces and provides the general entity parameters for E2S intrinsically safe products. Typical system diagrams detail how efficiently to employ different types of Zener barriers or isolators to control combination audio-visual signals and multiple alarm stages. Additionally, the article proposes suitable barriers for use with E2S intrinsically safe products which the company can source and supply as part of your product order. The intrinsically safe range from E2S includes audible and visual signals and manual call points suitable for use in Group II Zone 0 and Group I mining plus Class I Division 1 applications. The IS range features approval to ATEX, IECEx and NEC standards as well as Russian TR CU (EAC EX) certification. The guide can be downloaded from www.e2s.com/isguide.